Serie Expert: For perfect salon hair everyday. Your favourite Serie Expert products are back with a fresh new look, now in a larger bottle. 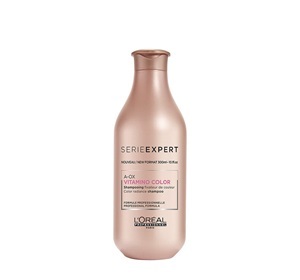 L’Oréal Professionnel Serie Expert Vitamino Color Shampoo for colour-treated hair. The luxurious liquid gently removes excess oil, dirt and impurities from your hair and scalp, whilst adding luminous shine to leave hair vibrant and healthy-looking. Technology enriched with A-OX, developed to protect the hair fibre and boosted with anti-oxidants. Recommended for: All colour-treated hair. Buy Serie Expert A-OX Vitamino Colour Shampoo 300 ml on-line today at Riah Hair.